The Marangu Route is the oldest and most well established trekking route on Mt. Kilimanjaro, and it remains extremely popular, despite a wide variety of other options becoming available. This path provides trekkers with the classic Kilimanjaro climbing experience, offering sweeping views and a wonderful hiking adventure all the way to the summit of Uhuru Peak. That said, it also has some unique aspects that set it apart from any of the other routes as well, giving Marangu a character and feeling that is entirely its own. Marangu Route offers a slow, steady climb to each of the daily camps, which has given it the reputation for being an easy trek. Don’t underestimate this trail however, as the approach to the final camp can be physically demanding with roughly 1000 meters of vertical gain on that day alone. Of course, summit day on Kilimanjaro is always a challenge no matter which direction you approach from, making the final steps onto the top all the more satisfying. Because it is one of the shortest treks to the summit – requiring just five days to reach Uhuru Peak – the Marangu Route is a popular one with trekkers who have a limited amount of time for their climb. The downside to this is that it doesn’t provide as much of an opportunity to acclimatize to the altitude. Because of this, Marangu route has the highest failure rate of any of the routes up Mount Kilimanjaro. Keep that in mind when choosing this option for your Kilimanjaro trek. The Marengu Route is also the only route that uses the same path going up and coming back down. That means that while the trail is a scenic one, trekkers will experience the same sites going up as they do going back down. And because it has traffic going both directions, Marangu can also get overly crowded at times too. Still, for a classic Kilimanjaro experience, it is tough to top this tried and true route to the Roof of Africa. The itinerary below describes the 5 nights/6 day Kilimanjaro climb via the Marangu route. To shorten the below itinerary to five days you skip the night in the Acclimatization day and instead walk straight from the Horombo huts to Kibo Huts in one day. After breakfast, you will leave Arusha and travel to Marangu Gate, the south-east entrance to Kilimanjaro National Park. On arrival at Marangu Gate, you will have time to check in and register. This marks the start of your ascent of Kilimanjaro. The first part of the route takes you through woods and rainforest, where you will see eucalyptus trees and many species of bird; you may also be lucky enough to spot some black/white Colobus monkeys. At these low altitudes, the soil can be wet and muddy, so make sure you have appropriate equipment – especially your footwear. Today’s stage takes you through the last stretch of woodland, and the vast expanse of heath soon opens up before you. As you walk, you can admire the ragged peaks of Mawenzi that rise up towards the African sky. A lot of people experience the first signs of altitude sickness at these heights, so please watch out for the slightest indication of illness and inform your guide without delay. When you reach Horombo Huts, there will be time to unpack and enjoy the view of Kibo before dinner is served. To give you time to acclimatize to the high altitude, you will be spending an extra day and night at Horombo Huts. If you are tired or affected by the altitude, it is important to stay at the camp and relax. However, if the altitude is not a problem, you can walk up to Mawenzi Hut and admire the magnificent view of Kibo and Mawenzi. Walk the route at a steady pace and enjoy the stunning landscape. Alternatively, you can make your way to the impressive Zebra Rocks, which involves a climb of 310 metres. Today, you will be walking through varied and remarkably beautiful countryside. To start with, you will continue across the heath until it gradually transforms into the dry, barren highlands linking Mawenzi and Kibo. The landscape here is scattered with large and small volcanic rocks, which testify to volcanic activity in years gone by. The last section of the route to Kibo Huts is quite steep and physically demanding. On arrival at Kibo Huts, you need to prepare your equipment and warm clothes for the next day’s trek to the summit. Keep your drinking water in a Thermos to prevent it freezing solid. Settle down for the night early to ensure your ‘human batteries’ are fully charged in preparation for Kilimanjaro’s ultimate challenge. The questions and answers below are specific to the Marangu route. The Marangu Route is attempted by many novices trekkers each year because it offers comfortable hut accommodation while other routes you sleep in Mountain tents. Many people perceive it as a less-difficult trek than the other routes up mount Kilimanjaro. This is a misperception! The 5 day route does not allow much time for acclimatization and can be very difficult, particularly if you attempt it without proper preparation. The 6 day option is easier, however, a good level of fitness is still required. What is the distance of the Marangu Route and how many days does it take? The exact trekking distance for the Marangu Route is 82km or 50 miles. The shortest number of days required for Lemosho Route is 5 days, but by the time you have added on arrival and departure days it is 9 or 10. However, as it the shortest route on the mountain it is actually best done over 6 days to increase your changes of success. 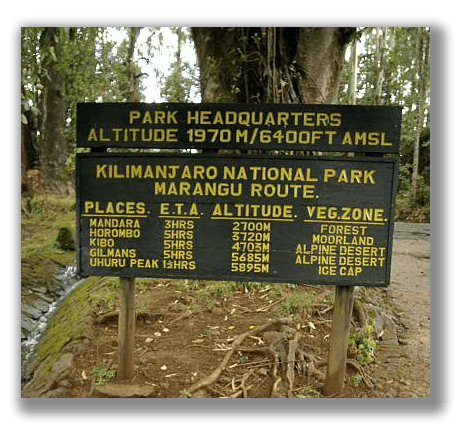 What is the Marangu Route Summit Success Rate? Because it has one of the shortest routes on the mountain, the Marangu Route has the lowest summit success rates. This is mainly due to unprofessional local operators taking people up the mountain on short 5 day trek. Because of this, the 5 day average success rate is under 50%! We advice our clients accordingly and we only take the 6 day option which means that our summit success rate on the Marangu route is over 90%! What is the Scenery like on the Marangu Route? 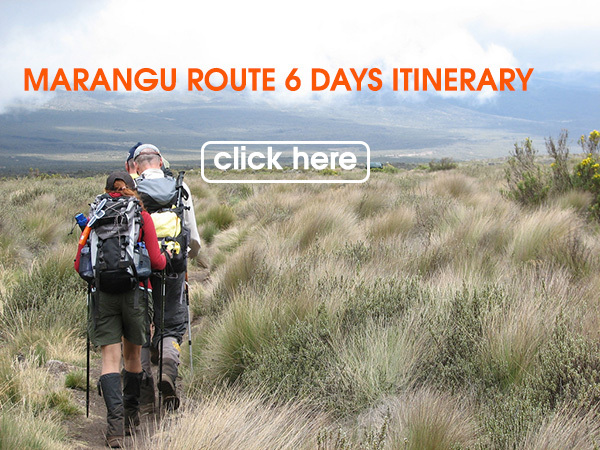 The Marangu Route ascends through rainforest, moorlands and alpine areas before finishing in the glacial zone. Whilst the trek is very beautiful, this is the only route in which you accent and descend back down the same trail. When is the best time to Trek Marangu Route Route?